My name is Felicien Fotio Manfo and I am new to this Forum. I came across the Blockstack project a couple of months ago and I immediately knew it was what my team needed for the projects we were working on. Blockstack objectives match one of the most fundamental principle we follow: Decentralization. As I dug into the great people and the company behind the Blockstack ecosystem, the only questionable aspect of it that caught my attention was the company corporate structure. I brought this up during a couple of exchanges I had with Xan and the engineering team and they suggested I posted my observation on this Forum. So I decided to bring it up here to the community to get their opinion. Blockstack PBC seems to follow the classic corporate hierarchical structure, which I am strongly against. They are alternative structures such as Worker Cooperatives that in my opinion would align perfectly with the basic principles the project itself is trying to promote. I do not in any means want to appear like I am not giving credit to the bright mind behind this great project. Instead I just want you guys to take my observation into consideration so that the project can be even better. I have played with Ethereum in the past and I very well understand that their platform is not scalable. Looking forward for any feedbacks or clarifications. I brought this up many many times. First in private chatting >>> Slack >>> Forum >>> Stealthy >>> Twitter >>> Youtube. I’m planing to organize a meetup to talk about the Blockstack BPC problem too. Point is I won’t give up. Why most people know Blockstack problem but only few shout out? Why people always choose soft words with Blockstack BPC? Is it for polite or they will lose something if they said what they really think? I think if a person really care about something, they will be straight and accept any consequence… Sometime, I asked myself is there anyone really care? @nguyenloc Thank you for your input. I hope the Blockstack team will jump in and explain why they made that choice. Blockstack is, in the least, decentralized enough to where any community or organization can host their own nodes and make their own software according to the specs – and even create their own virtual chain if they wanted to, on a different coin. If you feel like a “Worker Cooperative” (something I’ve never heard of before) would work great for the project, then I hope you have the ability to create it as a “competitor” to not only keep PBC in check but also to inspire more solutions to be explored while keeping them all compatible to the spec (third party browsers, hubs, nodes, etc come to mind). I have a feeling PBC needed to be created to handle all of the funding that they are able to acquire, while being efficient and responsible to those who sponsored them. Thankfully they remain open source and encouraging their community to work on their own projects as well. Correct me if I’m wrong but I think that’s OS property. It’s not decentralized. I hope you have the ability to create it as a “competitor” to not only keep PBC in check but also to inspire more solutions to be explored while keeping them all compatible to the spec (third party browsers, hubs, nodes, etc come to mind). I have a feeling PBC needed to be created to handle all of the funding that they are able to acquire, while being efficient and responsible to those who sponsored them. Hi Felicien. Thanks for following up. Yes, it is true we are not completely decentralized yet. But we are far more so than your typical US-based, for profit company. And we are trending in a decentralized direction over time similar to other blockchain projects. All of this is outlined in the blog post above. Can you pease provide more specifics? Where is Blockstack claiming more decentralization than we currently have? If there are miscommunications on these points we would like to address those. What types of activities, that are positive for users, developers, and investors, are currently blocked by our structure? You mentioned you wanted to fork Blockstack or create an entity with the ecosystem—anything PBC is doing to discourage you? We are open-source and want to encourage independent entities, please let us know where we fall short on that goal? Or how we can help? Would be great to hear more about your company, product(s), goals, and how that is all related to Blockstack? This looks not great for decentralized path though. @nguyenloc, thank you for your valuable input. You nailed down several concerns we have over the path Blockstack team has chosen to decentralization. It’s almost ironic that they chose this corporate structure in the first place. How can you advocate so hard for decentralization while your own structure does not reflect that same principle? I would admit that one thing both MichaelFedora and Jeffd seem to agree on is the fact that Blockstack is not fully decentralized. While Jeffd response was constructive to some extent, MichaelFedora’s is really disappointing. One big red flag to me is his reaction to my suggestion on Worker Cooperatives. He claimed he had never heard of it and my question to him is: “Was is that hard to look it up on the Internet before replying?” To me it appears as a denial to recognize the issue @nguyenloc and I highlighted, but also a clear refusal to start a serious discussion on alternative corporate structure that would perfectly align with the Decentralization principle Blockstack is advocating for. 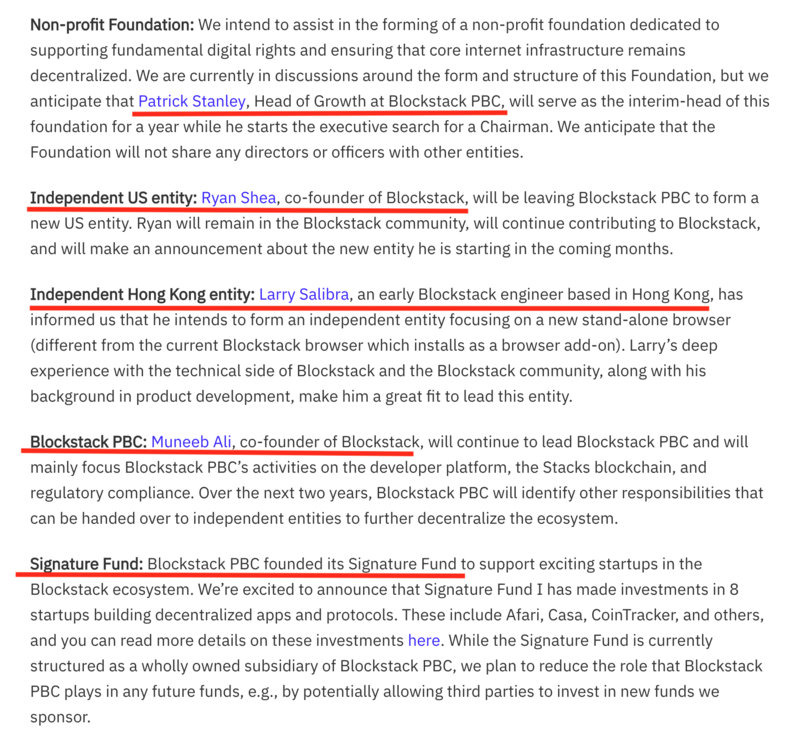 MichaelFedora then points out the fact that Blockstack PBC needed to be created to get enough funding for the project. My answer to that is very simple. He needs to realize that that type of funding is not needed for a truly open source project. Crow-funding would work very well as a funding source in my opinion. Please note that software developers around the world have continued volunteering for open source projects that they thought would help their communities without necessarily getting funds the way Blockstack does. I am one of them and I would be the first to volunteer on this project if its corporate structure was to change and reflect the decentralization principle it advocates for. My biggest concern is the Hierarchical structure of Blockstack PBC (Classic corporate structure that gives the power to the few at the top although the real value comes from the bottom). It is simply does not align with the decentralization principle Blockstack advocates for. I will stick with Worker Cooperatives as a possible alternative and I would suggest you to look into it. After listen to this podcast https://open.spotify.com/episode/4I5ew9vffEhRoSH8jRTmme and read 199 pages, I understand why Blockstack PBC is needed for now. 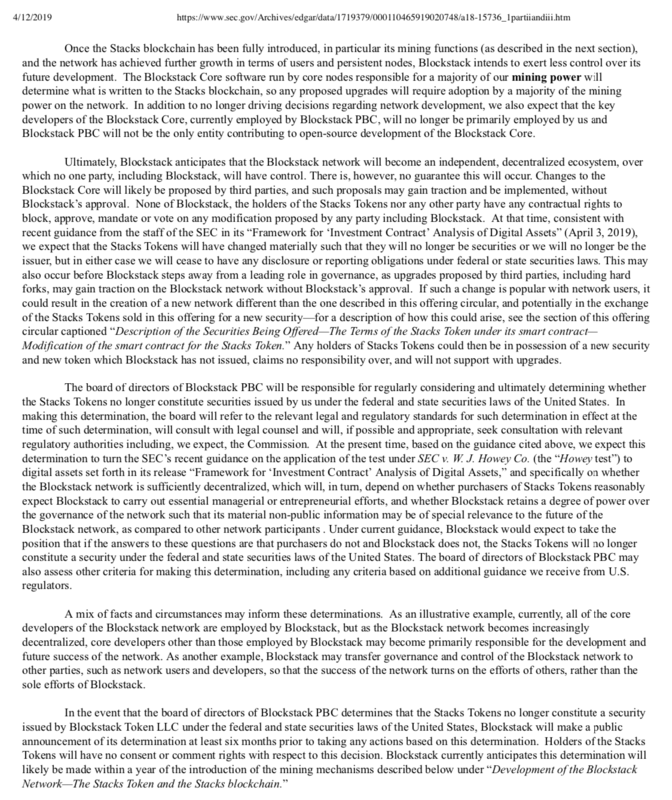 But in the disclosure state that we should aware of the risk Blockstack PBC conflict of interest. 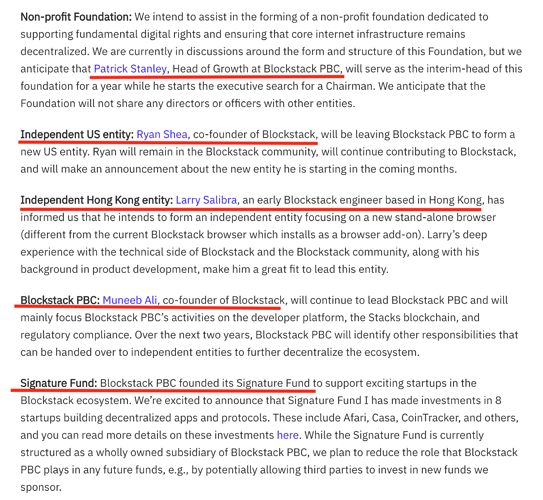 Right now, Blockstack is not decentralized and Blockstack PBC say that they will step away from a leading role in governance… Trust involved here. Now, the real question is do we trust Blockstack PBC? I have no answer for that. 50-50 though. I’ve just read it https://en.wikipedia.org/wiki/Worker_cooperative >>> It’s awesome! Yes, imo with some modifications, It could work well. Interesting discussion. My understanding and trust is also that Blockstack PBC is giving up responsibilities. For example, the app mining process has been moved in a first step to github, making it more transparent, more engaging for the community. Let’s set up a DAO (I like the EOS DAC). What would the constitution look like? This is one reason why I very focus on governance. It’d be great if we can find a way to protect something we really really care about (e.g. rules, protocols) that no one can delete/terminate/destroy it. Bitcoin is king because everybody know that no one can sole change the bitcoin protocol. What are you concerned about? You can’t expect a promise about services in a legal document. Listening to the team should give you some trust. What we care about? The network, the community, the protocol! Everybody can run a node. 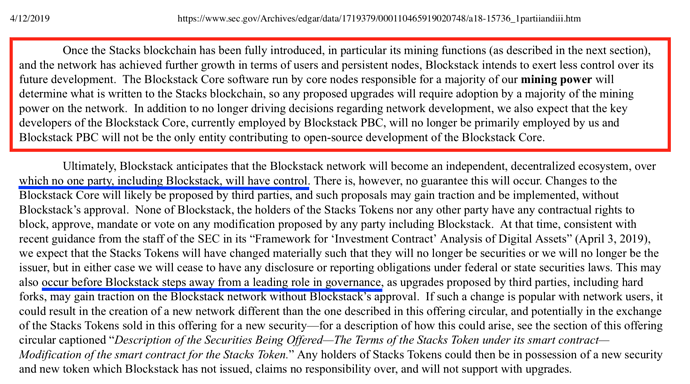 Proposed hard forks by Blockstack can be rejected by node owners. I don’t think changing the structure of Blockstack PBC will benefit anybody at the moment. Do you have a concrete suggestion? Do you want to implement a protocol how to merge pull requests (Currently : public reviews)? How to prioritize feature requests (Currently : quarterly public surveys)? How to adapt app mining (Currently : via github issues)? I would like to see a Gitcoin grant for the project! That’s why I said 50-50. Even If I believe Blockstack PBC are full of good people that does not equal with they will make the right decisions. Those thing relate to each others. For example, If a system have poor protocol, it won’t have much support from the community. And without strong/big community, the network is useless. I saw, heard some developers leave Blockstack. Some worry about Blockstack governance, they won’t join the system. Can you tell me how many Blockstack nodes are there? Because I asked once and got 19 nodes is a lower bound >>> imo Blockstack doesn’t have enough incentive to many people running a node. Do you have a concrete suggestion? Even Blockstack PBC say that letting Blockstack PBC governance the network is not good and it need to change. I think worker cooperatives with some modifications is good. Github maintainer may not permanent, could use voting for choosing maintainer and if (s)he doesn’t work well, there should be protocol to replace him. With this solution the network can still make decisions fast and still prevent the central point of failure. I really don’t know how Blockstack Github work but I guess (I could be deadly wrong) it’s not really public reviews though. Because the whole Blockstack-core is maintained by Blockstack PBC >>> looks like private review to me. When we solved the governance, app mining is very easy to solve >>> decisions could be make through voting, embedded in protocol or even through a group of reviewers who was chosen by some rules - of course, there is rule for replace reviewer as well. I think app mining is just a tip of the ice berg. Governance should be the biggest concern now. I may not able to solve any problem but I hope sometime I can point out some errors so people who are smarter than me >>> solve it. @elberto2008.id.block was referring to the corporate structure, we are now discussing project governance. From my perception, I’d say blockstack is applying a liberal contribution model: Under a liberal contribution model, the people who do the most work are recognized as most influential, but this is based on current work and not historic contributions. Major project decisions are made based on a consensus seeking process (discuss major grievances) rather than pure vote, and strive to include as many community perspectives as possible. But it also says that first the mining mechanism needs to be implemented and that it might take another year before blockstack can be considered really decentralized. Although Blockstack intends to decentralize development and governance of the network, the development of the Blockstack network may depend upon the financial resources and efforts of Blockstack, and Blockstack is under no legal obligation to continue development of the Blockstack network. There is no guarantee that we will be able to continue as a going concern. 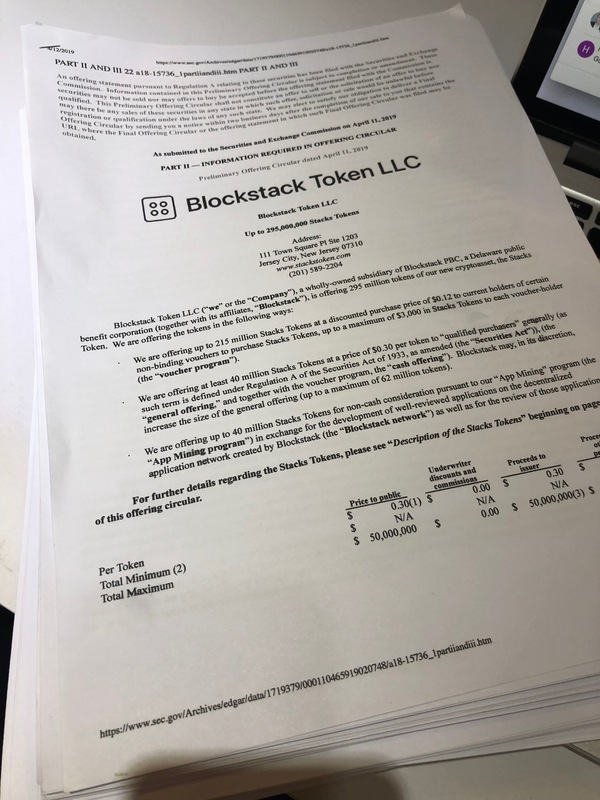 Blockstack PBC’s principal stockholders and management own a significant percentage of Blockstack PBC and will be able to exercise significant influence over matters subject to Blockstack PBC’s approval. What I see is we must trust a lot. 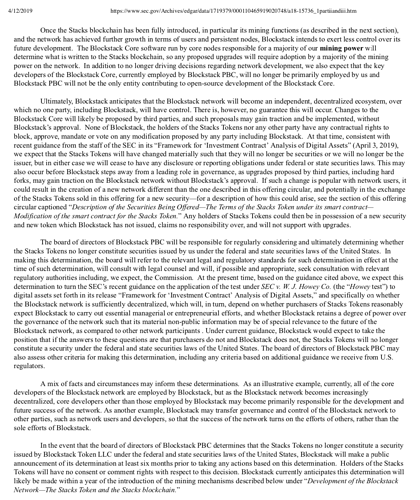 Muneeb once said “Google said don’t do evil - it should be can’t do evil” >>> I’d like the future where Blockstack PBC (or any person/entity) can’t do harm to Blockstack. I encourage everybody to think (many things to think about) and find the best way to make Blockstack fully decentralized. Step 1: Don’t rely sole on Blockstack solutions >>> find my own solutions though. I think to make Blockstack become decentralized >>> we should treat Muneeb as a normal person (like a smart person we know) >>> 7/10 he’s very smart and 2/10 he’s very stupid. The 2/10 times is when we come in and help him. Do not agree with his stupid ideas. Note: I use Muneeb represent to all smart people who involve in Blockstack. Just leaving a note here that for details and disclosures around decentralization I’d encourage everyone to read our SEC filing, available here and then search for “decentralization” to see the various sections discussing it.